PHILADELPHIA, April 2, 2019 /PRNewswire/ — MAPay, LLC, a global healthcare technology firm, has deployed a transformational healthcare payment network with an expanding customer base, positive patenting positions, increasing revenues, and multiple industry stakeholder acceptance. The company utilizes distributed ledger technology to power smart contracts to transact secure medical solutions on the MAPay network. MAPay utilizes a hybrid architecture of both centralized and decentralized protocols for multi-party medical payments and HIPAA-compliant data exchange. 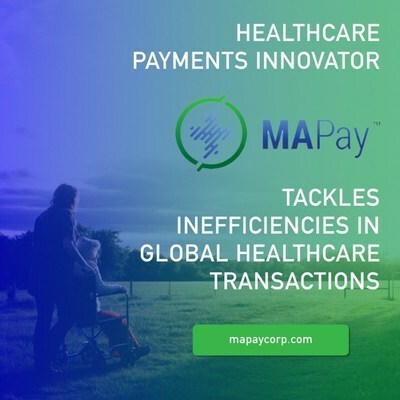 MAPay is poised to expand its payment network first built for the U.S., which spends $3.3 trillion annually on healthcare, with consumer out-of-pocket payments exceeding $515 billion, to capture the worldwide sectoral expenditure of $8.7 trillion. The company projects to have more than $11 billion in transactions processed through the network, with revenues of $471 million by 2021. The company derives revenues from both an enterprise B2B solution set, as well as its consumer-facing MEDspedia portal. Based in New Jersey, MAPay is led by founder and CEO Michael Dershem; a.k.a. “Dersh,” a seasoned business entrepreneur who brings an extensive history in the healthcare industry that includes both executive-level roles and ownership of companies. While serving as founding CEO of Pharmasset, an Emory University start-up, he successfully raised more than $25 million in private equity funding and executed $30 million research and development agreements with Big Pharma. Pharmasset subsequently went public and was acquired by Gilead Sciences for $11 billion. MAPay’s core business is its healthcare payments solution, which can reduce healthcare transaction costs by as much as 50 percent, while increasing transaction transparency, payment completion rates, and collecting proprietary data. MAPay has a unique patient-centric path to interoperability by way of its payment transaction engine and the trust it builds within its community. “An opportunity exists to eliminate a major portion of the claim processing and transaction costs associated with our own employees receiving care at our owned system network providers. Working with MAPay, we are hoping to create a payment network to streamline processing for our provider to our health system transactions, thereby reducing the historical network access and claims adjudication expense of operating the Plan by at least 20 percent while providing real-time transaction visibility,” says Michael Young, the CEO of Temple University Health System. Moreover, the future promise of healthcare depends on the availability and sharing of patient data. Because of business and technology reasons, however, this data remains stuck in silos. Conventional approaches to aggregating healthcare information for impact in research and population health management have been plagued with the business, structural and regulatory conflicts of obtaining and using data. If this data could be accessed and used by a broader community, it could provide price transparency, anonymized data for research and cures, and limit societal medical costs related to fraud and abuse. With the rise of new technology, MAPay’s mission is to place healthcare records on its permissionable multi-node blockchain for secure patient-driven use, as well as utilizing this information to impact population health management. For the first time, patients will be able to authenticate themselves into the healthcare ecosystem, not the other way around. Despite the fact that interoperability between these has existed in the industry since the advent of the Commodore computer, until now, these records have been hard-siloed off into institutional and/or business structures that did not communicate with one another. In addition, patients are often granted little or zero access to their own medical records. “This is no longer a technology issue but rather, a business and regulatory issue. Our doctrine on blockchain driven by the patient may be the answer to getting to the trends shaping the discussion of population health management, dynamic diagnosing as well as fraud and abuse,” says Dershem. “MAPay has a proprietary technique to aggregate financial, clinical and contextual data through an individual patient-provisioned methodology. I’ve yet to see anything as transformational as what Dersh and his team have created. Physicians and other healthcare providers will have access to information never before available to drive more customized and effective interventions to treat patients leading to better population health and outcomes,” says Jenny A. Witthoff, VMD MS, a global health researcher and adjunct professor at Georgetown University. MAPay has already gained plaudits and recognition for its novel payment technology. The firm is working in collaboration with leading organizations focused on interoperability; has been in discussions with several major US hospital systems for onboarding; and has been in conversations with multiple practice management systems. The company is poised to announce global partnerships with two top-tier technology services and consulting firms, as well as a full-scale international deployment on a countrywide basis of its platform. This will be the first of its kind for any fintech firm in the world.